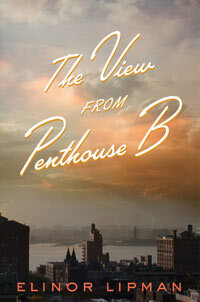 The View from Penthouse B by Elinor Lipman . Publisher: Houghton Mifflin Harcourt (April 2013). Contemporary fiction. Hardcover. 272 pages. ISBN 9780547576213. It starts off all charming and filled with situational-comedy-setting humor as a widowed sister moves into her divorced sister’s penthouse. Younger sister Betsy suggests that middle sister Gwen-Laura and older sister Margot might make ideal housemates. Gwen-Laura’s been a widow for two years, her husband died suddenly from a congenital heart condition. Margot endured an acrid and publicized divorce when her fertility specialist husband decided to impregnate some of his clients himself. Also, she lost money to Bernie Madoff. They’d never been close. Margot rather lavish and Gwen rather goodie-goodie. “It was kind of her not to make me admit my most obvious shortcoming: I would be a sad roommate who couldn’t be counted on for any fun at all.” They take in a younger gay guy, Anthony [a cupcake baking former Lehman Brothers financial analyst] as housemate and form a modern family. When Charles, Margot’s ex-husband, gets out on parole and moves into the building he starts wiggling his way back into his ex’s life through bi-weekly dinners that Margot initially refuses to attend. But old feelings start to defrost. The focus shifts to heavy matchmaking for Gwen. Urging her to write a personal ad and sign up for online dating. There’s amusing writing about dating in your 40s and 50s. The strong bond that develops between the disparate sisters kept me reading The View from Penthouse B. They depend on each other as never before and care deeply for each other’s happiness and well-being. Along with Anthony, Margot and Gwen have quite the set-up in penthouse B that anyone would envy. [It was our nuclear family. As of that day, it was the only portrait I could paint of the widow Gwen-Laura Schmidt where she was neither lonely nor alone.”]. This would’ve been enough for me but apparently in women’s fiction all women MUST get married or married again or they be failures. This entry was posted on April 21, 2013, 14:26 and is filed under Books. You can follow any responses to this entry through RSS 2.0. Both comments and pings are currently closed.